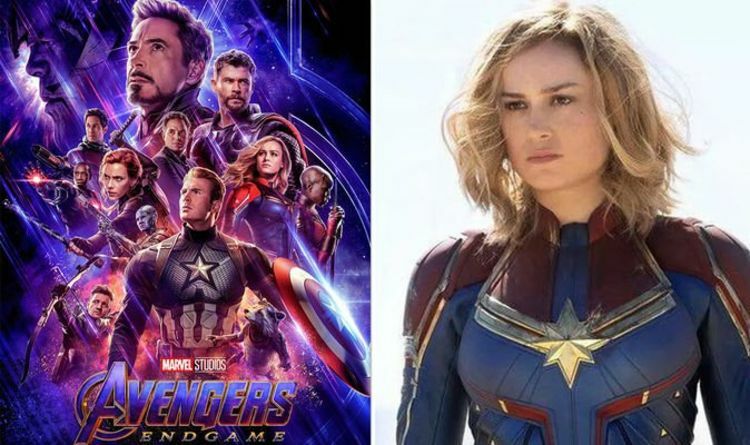 The Avengers: Endgame trailer has put Captain Marvel right in the action. Though she only appears in the very end of the trailer, fans are already excited for her to help the superheroes defeat Thanos. Brie Larson, who plays Captain Marvel, underwent a slight change from her 1990s standalone movie look and not all fans are pleased. In the trailer for Avengers: Endgame, Captain Marvel has a friendly showdown with Thor. In an attempt to startle her, Thor summons his hammer. The hammer whizzes straight past Danvers’ ear, but she doesn’t flinch. Thor says stonily: “I like this one,” before smirking devilishly at Natasha (aka Black Widow played by Scarlett Johansson). But fans were quick to notice Carol Danvers’ new look. She has a full face of glamorous, very flattering, make-up. It is every woman’s choice whether or not she wears makeup, but fans were slightly concerned by the sudden shift from her Captain Marvel solo-movie days. When she crash lands on Earth in Captain Marvel, she wears no make-up. AVENGERS ENDGAME SUPER BOWL TRAILER: DID THE TRAILER EDIT SOMEONE OUT? In fact, in the comics, her aversion to make-up is well known. Only a cursory search of Twitter to reveal some fans were displeased with the sudden makeover. One user wrote: “Captain Marvel is wearing make-up on an official trailer, why? Of course, a lot could have changed for Carol in the time between her 90s Captain Marvel debut and the present day in Endgame. But the fact that the Endgame directing duo are men was not lost on fans either. The more present male-gaze in Avengers: Endgame is not as lascivious as it is in other films, like the Transformers series or Alita: Battle Angels. Avengers: Endgame is ou tin cinemas on April 25, 2019.